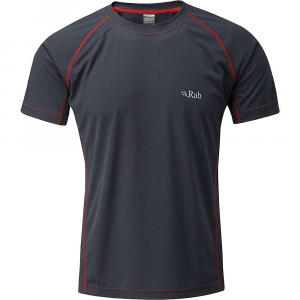 The Better than Naked Shirt is a loose fitting, lightweight, breathable, quick drying, synthetic fiber shirt, which is designed to be worn during highly aerobic activities. 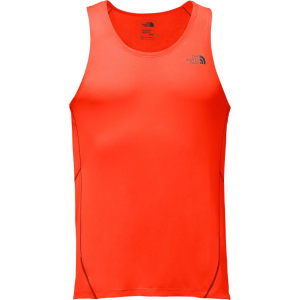 TNF claims its Flashdry technology reduces drying time and improves breathability. 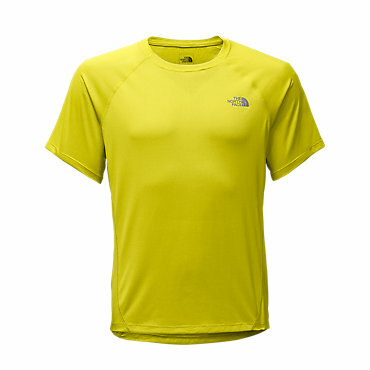 This is a review of The North Face (TNF) Flight Series, Better than Naked Shirt, Men’s X-large made in Thailand. I was provided this shirt from the manufacturer for testing through the Trailspace Review Corps. Its color is mainly silver in the body, with black and grey making up the torso/armpit area. 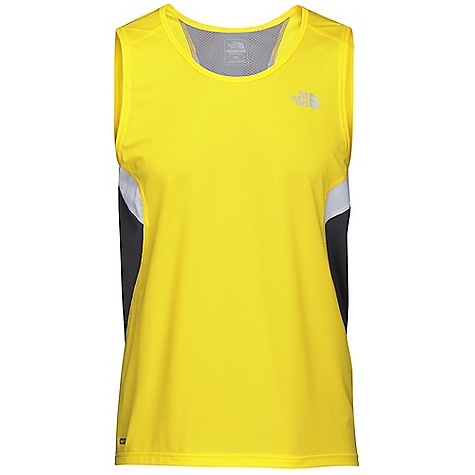 This shirt is marketed as a running shirt by TNF. From the label: "Athlete tested, competition proven. Built to keep you running in any in any weather, on any terrain." The Better than Naked Shirt's body is comprised of (as indicated on the label) 88% polyester, 12% polyolefin. The side panels are comprised of 90% polyester, 10% elastane. The underarm areas are comprised of 100% polyester. The neck is a loose fitting crew style. The sleeves are raglan style so the seams don’t rest on the shoulders which are great for wearing under pack straps. All seams are flat stitched to prevent chaffing. 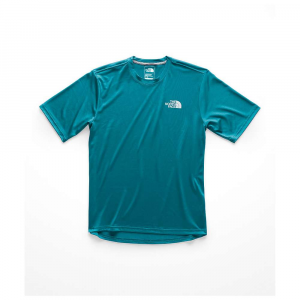 The North Face Logo is reflective and is positioned on the shirt’s upper left front. 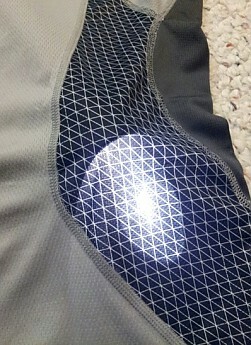 The “Flight Series” symbol and wording are on the back of the collar, centered. 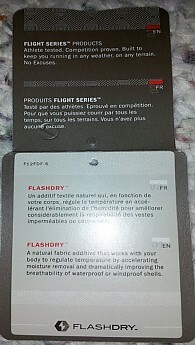 The word “Flashdry” is on the back of the shirt, bottom right edge. The stitching had no visible flaws and I didn’t notice any snags in the fabric. 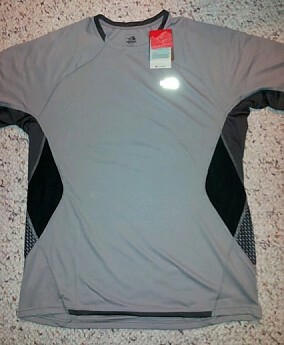 The shirt’s body is more of a knitted mesh typical with running shirts and the torso vent and Burnout panel are more of a mesh fabric (not see-through). I weighed this shirt using a calibrated electronic scale I have at home, which I use to weigh my gear, and the shirt weighs 5.1 ounces dry. It does not require special laundering. 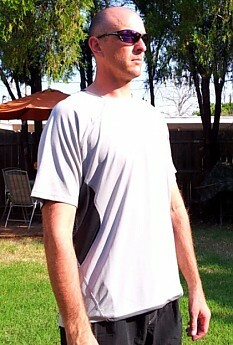 I like to group the types of athletic wear fit into three different groups: compression fit, fitted, and loose fit. I believe this shirt falls into the loose category. I received the extra large and based on other similar shirts I own, I would say the fit is true. 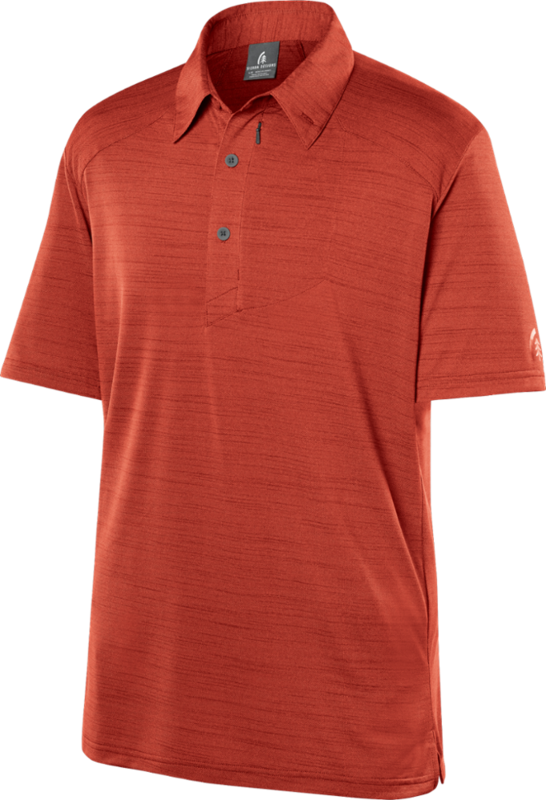 I have many different types of breathable fabric shirts that I use during various activities and all of the shirts are made from a synthetic fiber. 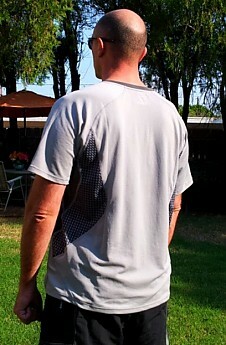 The one characteristic I notice with my shirts is heat buildup on in the shoulder area during activity. Now this only really happens when I run. It seems that body heat gets trapped right in the shoulder area and I notice it as the activity continues. This is mostly noticeable, for me anyway, in an indoors environment, during calm conditions. Also, this is subjective to the temperature/humidity. In cool, dry conditions, it isn't an issue. In warmer, more humid conditions, it is an issue. 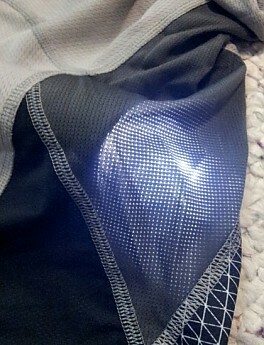 I was hoping the Better Than Naked shirt with FlashDry would alleviate this issue. Mountain Biking: 11 mile ride on mostly smooth dirt singletrack with 1.5 miles on a paved trail about midway through the ride. Conditions at the start were sunny, 77°F, 51% humidity, south wind 13 mph. Conditions at the end of the ride were 82°F, 37% humidity, south wind 16 mph. I didn't sweat for the first 4 miles. 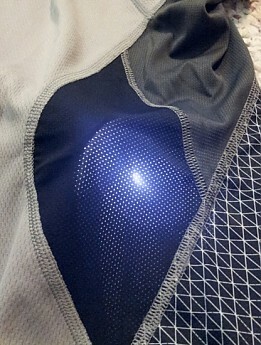 As I rode along, I immediately noticed the shirt had an "airy" feel to it, especially under the armpits. On mile 5 through 8 I started to sweat as the trail gets a little more technical. 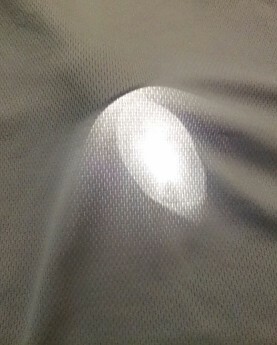 I was using a Camelbak Rim Runner pack and the shirt began wetting through on my back due to the reduced airflow in this area. The shirt was just starting to wet-through on my chest area. About mile 8 or so a majority of the shirt’s chest area was wet and I started on the paved trail to cool down a bit and see if the shirt would dry a little. By the time I completed a loop and returned to the dirt, the chest area of the shirt was mostly dry. My back was not dry but that's due to the pack. The durability of the fabric was tested on this ride but not intentionally. My right shoulder brushed a tree as I rounded a curve but the fabric showed no signs of damage. However, I did sustain an abrasion on my shoulder. I did not wash the shirt after this ride. At the Fitness Center: I ran for 30 minutes on the treadmill and lifted weights for 30 minutes. This is a military facility so the climate control systems are always well maintained. The air temp was 76 - 78°F and the humidity was between 40 - 50%. There was a large fan nearby the treadmill I occupied, but, I didn't use the fan because I didn't want the air movement to dry the shirt. During the time on the 'mill, I noticed the heat buildup around my shoulders but it didn't seem as noticeable as with my other shirts. After 30 minutes of running, the shirt was thoroughly wet. I then moved to the weight room and lifted weights for 30 or so minutes. The shirt remained damp at this point. There are large fans in the weights area which were in operation at the time. By the time I was finished, the shirt was starting to dry out in spots, like the sleeves and chest area. I departed and walked outside to my vehicle. It was sunny and in the mid 80’s with a breeze blowing. I stayed outside of my vehicle for several minutes and the shirt had begun drying more rapidly. When I arrived home, I noticed the shirt was retaining body odor, especially under the armpits, so I decided to wash the shirt. I hand washed it in a bucket with a little laundry soap and air dried it. Mountain Biking (again): At the start the conditions were 77°F, 37% humidity, south wind 25 mph. Conditions at the end were 84°F, 39% humidity and the same wind speed. I rode for 12 miles along the same trail I did the first time. I maintained a more leisurely pace this ride and I didn't sweat nearly as much as with the first ride. The back area was about the same due to the pack. The shirt’s durability was tested once again. There is area of the trail in which the rider must turn left across a large tree root and navigate a 2 ft drop. I generally can ride this section with my eyes closed 99 times out of a hundred. On the rider’s right is the tree which belongs to the root so there is little room for error. Well, I guess my hundredth time was up and I clipped the tree with my right shoulder which caused me to crash. I wasn't able to unclip from my pedals so I just rode it out. I landed on my left shoulder and skidded to a halt. Other than getting dirty, the fabric was undamaged. 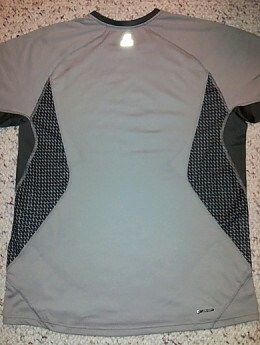 Even though this shirt is marketed as a running shirt, it has so far, held up to my abuse on the mountainbike. Trail Run: At the start it was 76°F, 60% humidity and the wind was south at 20 mph. I ran for just under 3 miles on a rolling trail. I took a route which resembled a lasso loop. During the first mile and a half, the wind was generally at my back and I noticed the shirt retaining sweat on the chest area but the airflow through the side “mesh” areas compensated for it. On the return to my starting point, I was running into a headwind and the shirt almost completely dried out by the time I had finished. I’m sure the 20 mph headwind helped speed up the drying, but, it sure slowed me down! Mountain Hike: The hike started in the morning at an elevation of 6,892 ft ASL and ended 4.2 miles later at a peak elevation of 9,608 ft ASL. The humidity was about 13% and the temp was 62 deg F at the start. The wind was from the west at 10 to 20 mph. The majority of the hike takes place in a canyon on the east side of the peak, so it was sheltered from a majority of the wind. It wasn't until I reached the peak when I could feel the full force of the wind. 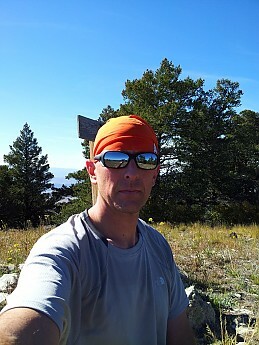 When I reached the peak the temp was around 73 deg F and the humidity was unchanged and windy. Since the conditions were so dry and relatively cool, I didn't sweat much. The shirt was a little wet in the areas coming in contact with my pack, such as, the back, the waistbelt, under the pack straps and across the chest strap. Otherwise, the shirt had that same "airy" feeling. I like the fact that there were no seams under the straps of my pack (Cold Cold World Chernobyl) as well. I like the Better than Naked Shirt with FlashDry very much and would recommend it to anyone looking for a quality made, durable, lightweight, well fitting, breathable shirt that is quick to dry. The reason for the 4 and a half stars is the pit odor issue. The most I could use the shirt before washing it was two days of activities, but that is subjective to the user. My other synthetic shirts are generally the same in this regard. The MSRP on the shirt is $55. Wear it for all of your active pursuits! This concludes my review of TNF Better Than Naked SS Crew Shirt. Thanks for reading. 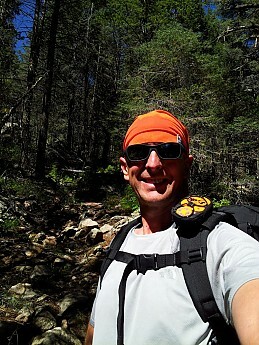 Thanks for testing the Better than Naked Shirt, Rob, and for sharing your results. Great review Rob. I love the level of detail and the pictures! Rob, great job on a very solid review man. I read it on the ol' phone while I was at work when it first hit the boards. Very well done. Good review. One question though...are you a "heavy" perspirer? 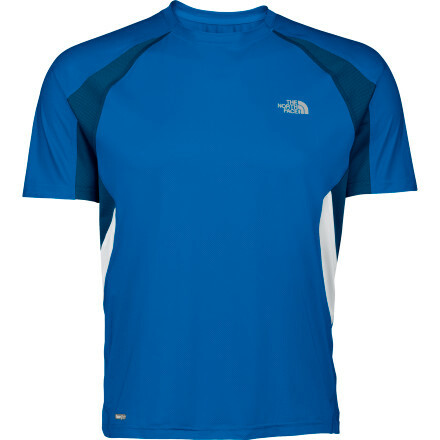 The North Face Better Than Naked Crew is not available from the stores we monitor. It was last seen August 25, 2018	at REI.